Does anyone else go stand outside in the rain when it’s sunny looking for rainbows? Last Sat, we had one of those days here. I just finished working out, & it’d been rainy & grey all morn. Well, I was almost done, when I looked out the window & saw that it had become sunny. It was still raining, but in the beautiful sunshine. So, I finished up & hightailed it outta there. On my way out, the lady at the desk (they all know me so well in my town) saw me fixated on the windows of the door as I was headin towards it, & said to me “You’re going to look for the rainbow, aren’t you?”. I said “yup” (I’m a girl of few words. haha, ok, so I’m not, but when I’m focused on something I can be.) She said I needed to come back in & tell her what it was like before I actually left. So, I walked outside, & had to look around for it. I couldn’t find it anywhere. It took an 8 year old boy riding his bike through the parking lot to help me find it; “look over there”. So, I did. It was a short stubby rainbow. Wide, but short. I’d never seen one like that before. I could see both ends of it, & the top of it was so low to the ground. Very cool. So, if it’s sunny & raining, high-tail it outside to see one of these babies, ‘kay? Cause no two are alike, & if you miss it, that’s it. There’s no instant replay on ‘em. Then, this morning, I check my email, & my friend Jen sent me this awesome pic. Thanks, baby-doll! How cool is that?!? So, I’m sharing w/ y’all. 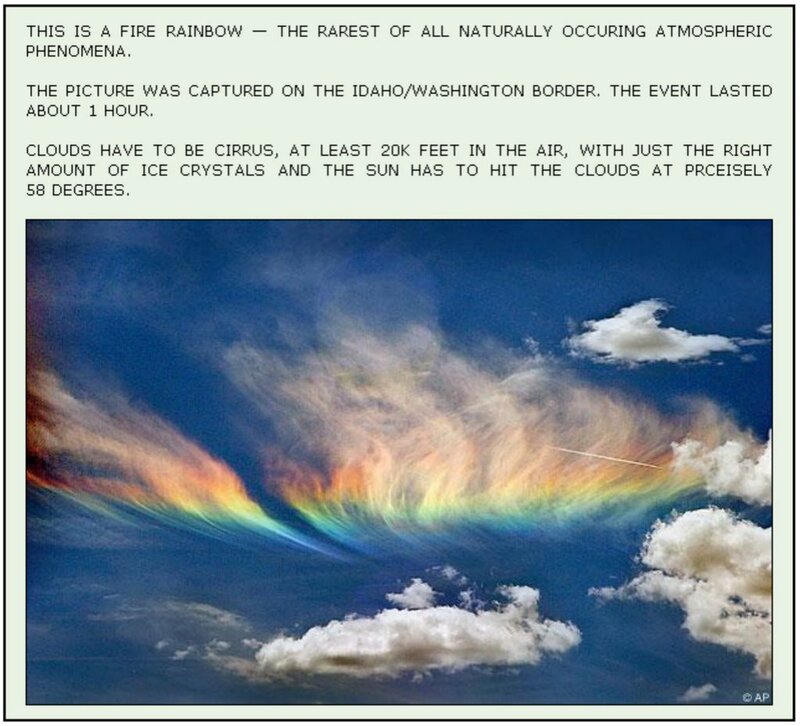 How awesome would it be to see a Fire Rainbow in real life…the pic is so amazing! Thanks for sharing! Oh, and thanks for reminding me to look for rainbows, I often forget and then am sad because I remember too late! Luckily, Urban Cowboy’s mom is a lot like you (in the rainbow dept) and if we’re hanging out with her she always finds them! I kinda like calling him ‘Urban Cowboy’. Does he know we call him that sometimes? Rainbows are amazing. I always feel so lucky when I blessed with gift of being given one.